This range of ribbons are for applications which require excellent resistance to solvents and to high temperatures. They have excellent resistance to smudge and scratch along with excellent printing quality. They are suitable for most printers with flathead technology, inside or outside wound and available sizes are listed below. PREMIUM RESIN - AXR 8 For printing onto Synthetics (polyester, polypropylene etc. 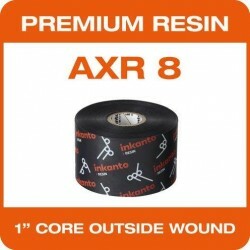 ), AXR 8 is recommended when excellent resistance to solvents and to high temperatures is required. With superb resistance to smudge and scratch, AXR 8 also gives exceptional print quality.